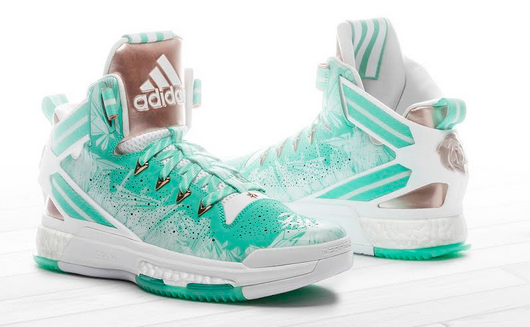 Just in time for the Holidays, adidas unveiles its Christmas Day pack. Featuring winter-inspired editions of the D Rose 6, Crazy 8 and Crazylight Boost 2015, adidas athletes including James Harden and Derrick Rose will lace up the special editions on Christmas Day match-ups. Only the D Rose 6 will be made available in the Philippines which features a mint-green and crystalized frost print upper contrasted by an iced green outsole and clean, white details throughout. Designed with rose gold hits at the tongue, faceted eyelets and heel cap, the Christmas Day edition delivers an elegant finish. The shoe also features crystalized graphics and gold details in the sockliner. The D Rose 6 (PhP8,795) drops later this month near Christmas day 2015 at adidas Trinoma and Titan stores. Join the conversation @adidashoops on Twitter and Instagram with #DRose6.